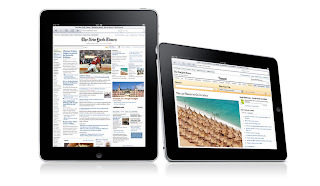 Apple recently(27.1.2010) revealed a new portable tablet device called the Apple iPad Needless to say as always is the case of Apple.inc, its a new innovative product that has now set a new generation of devices. It definitely has attracted a lot of media attention and all the hype it could all across the world. The iPad actually looks like an iPhone magnified. Its got a 9.7inch multi touch, high resolution (H.D. ),bight screen, led back light with IPS technology. It weighs in around 1.5 lbs. That's just a little over half a kilogram. Its 0.5 inches thick. So its pretty handy. almost half the size of an A4 size printing paper. Its got an Apple A4 1ghz processor. Makes me wonder why they went ahead and spent money on developing a new chip, when there are so many chips of the shelf they could have used. That would have probably made the iPad a little more cheaper. It has WiFi 802.11n, Bluetooth 2.1+EDR, 3G is present in the top versions, an accelerometer, ambient light sensor, microphone, speaker a compass and a standard apple 30pin connector. I wish if it turns to a micro or mini USB in the next generation. It comes in various capacities ranging from 16GB to 64GB flash drive the prices go up with the capacity. Its got pixel doubling technology so it can run all the apps which run on the iPhone or iTouch straight out of the box so its a win win. The battery life is an impressive 10 hrs with usage and 1 month standby, that's what Apple claims. Its almost like an iphone it supports most of the popular Video formats H.264 video up to 720p, 30 FPS, .mp4, .m4v, and .mov file formats; MPEG-4 video upto 640 by 480 pixels, up to 2.5 Mbps, 30 FPS mp4, .m4v, and .mov file formats. Audio Formats include MP3, MP3 VBR, AAC, Apple Lossless, AIFF, and WAV. But the biggest problem is it doesn't support multitasking. Well in the end the Apple iPad is a great device. But if you already have a laptop smart phone and a ebook reader it not worth buying it. But if you plan on buying your first netbook/laptop better go for the iPad. You can even play games with gesture control which is a great deal. Its a really great device for reading ebooks its even got an anti glare screen which is softer on your eyes, plus you can even read perfectly in sunlight. Its gonna give the Amazon Kindle a great deal of competition. It cost 499$ for the basic WiFi version. The target for this product is student and book readers. Universities and Students can use it for a great deal of study work. As of now, like always Apple comes up with a great deal of improvements with its second generation of products. So its better to wait for the second generation. Speculations are the next generation will have a camera and will support multitasking. Labels: Apple inc, Apple Ipad, Computers, Ipad specs.